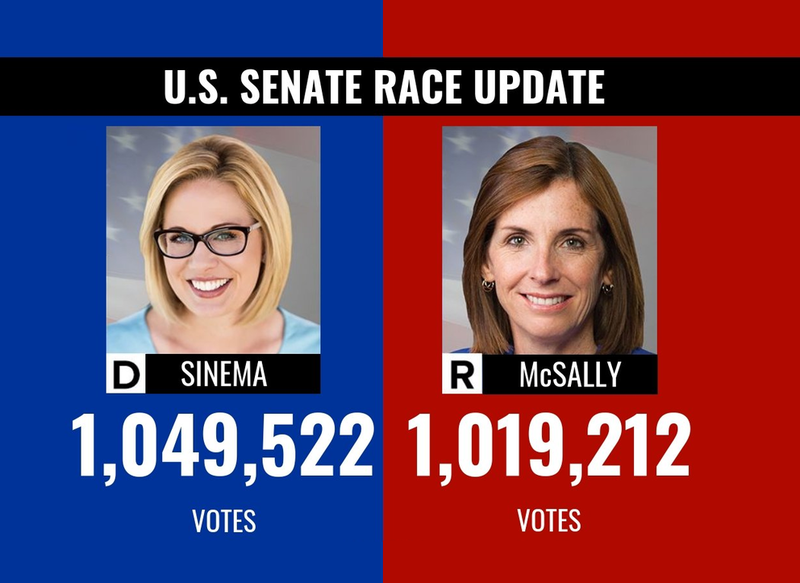 Almost one week after the Congressional elections took place, the Democrats won the battle for the senate seat in the state of Arizona. Democratic candidate Kyrsten Sinema won against her Republican opponent Martha McSally after the latest vote count showed McSally trailing by more than 38,000 votes out of more than 2.2 million ballots cast. Ms McSally conceded in a video message on Twitter Monday night and congratulated her competitor. The seat in Arizona was thus far in the hands of the Republicans. Outgoing Senator and known Trump critic Jeff Flake decided not to stand for re-election. The last time the Democrats in Arizona won a senate election was in 1988. The US voted for a new Congress last Tuesday. All 435 seats in the House of Representatives were vacant, and 35 of the 100 seats in the Senate, the other chamber of parliament. Due to the sometimes narrow difference, the count in some states took longer. The battle is still open in two states. In Mississippi, an runoff vote is scheduled for the end of November and in Florida votes are being recounted due to the extremely narrow difference. Republicans lost their majority in the House during the Midterm elections but successfully defended their majority in the Senate. Even in spite of the defeat in Arizona, they are certain to keep 51 out of 100 seats. If the other two senate elections are favorable for the Democrats, that does not change anything for the Republican majority in the Senate. It would mean that they only managed to keep their tight majority with great difficulty, instead of expanding it as they had hoped for. lack of transparency, no push back, completely rigged. This was an election in which the republican was way ahead before they “found” votes. This late count bs always seems to favor the Ds. There is no election integrity in this country. The blatant stealing of elections needs to be addressed in a legal manner, yet I do not see that happening. Perhaps the left`s mode of operation should be used & riots need to show the publics disdain for such openly visable voter fraud! I`ll bet my life that she came no where close to winning with legal voters. Americans do not want Taliban sympathizers in the Senate! LIES LIES AND MORE LIES!!! CHEATING REPROBATE MAGGOTS!!! I HOPE THEY PAY WITH THEIR LIVES IN GITMO!!!! It's time for Americans to put up, or shut up. It's blatantly obvious that the law is only there to impose Government will, on we, the people and they will NEVER hold the treasonous bastards accountable. Either we do it, or let your children live with the consequences of your cowardice inaction. The Constitution DEMANDS that we throw these scumbags off and it is NOT Treason to do so. Quite the opposite, it is treason to continue to allow these scumbags to hold power. so basically no change over the McCain dynasty. To be honest, is this really any different than Flake being in office?